American Tank Company's shop built corrugated galvanized steel water tanks are used for a variety of applications such as drinking water, fire protection, irrigation, municipalities, and wastewater treatment. Based on a century old, time-tested concept in tank design and construction, galvanized corrugated steel tanks are hand riveted to provide watertight, durable, quality storage tanks. 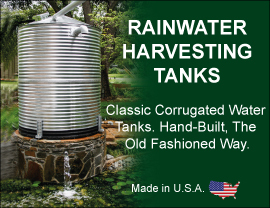 American Tank Company’s corrugated galvanized steel water tanks are backed by a one year manufacturer’s warranty against material or workmanship defects that can cause leakage or corrosion. Due to wind resistance at highway speeds and unforeseen weather conditions, cosmetic damage to the deck (roof) is likely to occur during delivery shipment. While these minor imperfections may remain visible, they will not compromise the structural integrity of the tank.